Don't have any memories of this personally but it seems to have been a favourite for many Coventry Kids in their younger days. 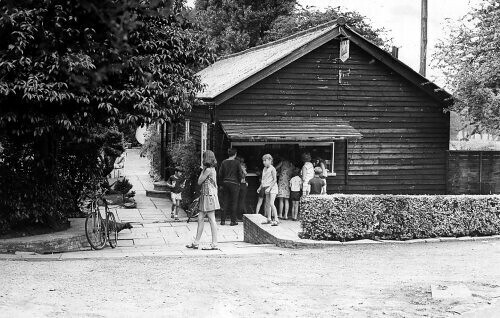 This is a picture taken in 1969: It wasn't just an outlet serving local kids, there was a sophisticated cafe inside. In the 1950s we used to visit by car, it was like a trip to the countryside for us. The local kids were always lined-up on the bridge with their legs dangling over the side and they were splashed with water when we ploughed through the ford. Hi, I enjoyed the short film. Canley Ford and the Milk Bar was always a must go to place when I was small, done a lot of courting down there and then used to take my own children there. Not been in years now but my children are now of an age where they are seeking out all of these forgotten places. Thanks for the memory. Hello there, Wonderful place to look at probably good to walk across. Wonderful but short video. Thanks BrotherJoyBert. I've recently moved back to Earlsdon and after a couple of months we went for a bike ride and I boldy led stating I knew the way down towards the Milk Bar and the lane alongside Hearsall golf course. My aunt used to live in Green Lane and I spent many a summer's weekend afternoons going down that route with the family. Unfortunately that was in the 70's and now some 30-odd years later I was pretty much lost and had not realised the cafe was not there anymore! All the shrubbery and trees seem to had grown somewhat during the inbetween years! Dutchman's photo is exactly how I remember it. We had some great times at Canley Ford as kids in the 70's, sadly the place now has a bit of a reputation as it's used by men with dubious intentions. That is such a shame Skyblue, it was a lovely place to take the kids. It was posted on Flickr by the Coventry Telegraph - link I think Ms Esh Capello was the member of staff who posted it. Mr. Larry Watson from the guest book would like to know when the Canley Milk Bar closed. As usual I am not able to help with this one but I know one of our regular members would know. Thanks. Canley Ford on YouTube, the person of this says the Milk Bar is overgrown now, shame as it would make a bomb now with recession, somewhere cheap for the kids. It's got to be in the 90s when it closed. Thank you for the link morgana. The Milk Bar may have closed down but lovely to see Mother Nature is still living on. I hope Larry Watson is looking in. You're welcome Dreamtime, yes it's lovely isn't it, I think in the background of one part you can see the Milk Bar, hope Larry Watson enjoys it.